You can’t beat the old school charm of a diner. Every corner of Columbus has at least one good diner. They’re institutions. Many of them have been around for decades, winning generations of fans with simple food and big welcomes. Looking for a classic breakfast or lunch spot with the family this month? Try visiting one of these old school diners. Dan’s Drive-In claims to be Columbus’ first drive-in, established downtown in 1951. Over the years it moved further south down High Street. The spacious diner is done up it bright reds and whites and chrome. Kids will love all the vintage knick-knacks on the shelves. And everyone will love the big plates of pancakes, roast turkey sandwiches, and even fish dinners. Chef-o-Nette also claims a little Columbus history as the country’s first drive-through. Owner Harlan Howard said their restaurant opened with a drive-through window in 1955, and they can’t find record of anyone doing it prior to that. While the little drive-through window is fun, we suggest sitting down for a meal at the diner. If there’s just a couple of you, you can sit at the big, U-shaped counters. If you’ve got a bigger crew, slip into a booth or find tables in the back room. You can’t go wrong with their inexpensive meals like waffles or griddle cakes for breakfast, or burgers and the hangover sandwich for lunch. Make sure you top of the meal with one of their homemade milk shakes! Fitzy’s Old Fashioned Diner is the place to go if you’ve got a hungry family to feed! 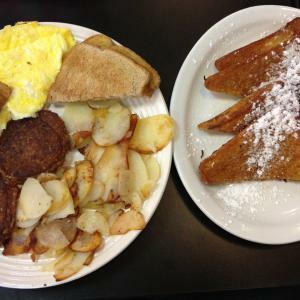 The Worthington diner serves up huge dishes of breakfast and lunch. Appetizers run from nachos to chili cheese fries, while lunch includes “Slam-wiches” with onion rings or entrees like liver and onions. They’ve got a special kids and seniors menu, too, for the under 12 and over 60 crowds! Jack’s Sandwich Shop is the perfect stop for an old school breakfast or lunch on a weekday. The back alley diner has been in business since the 1940’s, and in its current location since the late 60’s. Owner Chris Kowalski and his crew will serve up hearty breakfasts like pancakes (still using Jack’s original recipe! ), steak and eggs, or breakfast sandwiches. Or stop in at lunch for a double cheeseburger or a meatloaf dinner. Honey Dip Donuts & Diner has earned a lot of fans with their donuts over the years, and just two years ago they renovated to add a diner side to the operation. They’re serving omelets, biscuits and gravy, and pancakes. The really daring family members can order a breakfast sandwich, burger, or BLT with… you guessed it, donuts instead of buns! Tommy’s Diner knows families because it’s run by a family! Tommy and Kathy Pappas, and their sons Michael and Louie, have been feeding families for decades at their Franklinton diner. The kitschy diner is full of knick-knacks, photos, and bright neon lights. It’s the perfect setting to enjoy an omelet, a gyro, or a roast beef dinner. After your meal, check out the wall of Tommy’s photos with different famous visitors. This is just a sampling of the diners around Columbus! What’s your favorite old school spot to visit with the family?